An addendum will be printed in April. If your camp was not included, email [email protected]. S Northern California Flute Camp, Carmel Valley, is a one-week, intensive program for serious flute students ages 12-18. Our curriculum includes solo performance, private lessons, master classes, flute choirs, chamber music, and seminar and electives classes taught by an accomplished faculty. Dr. Bradley Garner will give Guest Artist classes. Tuition with housing $1,395. 7/6-14. 45-50 students. Contact: 408-784-3355, [email protected] mail.com. S Pacific Music Camp, Stockton. Now in its 73rd year, Pacific Music Camp offers a wide variety of ensembles, electives, and social activities for junior and senior high school musicians through five camps: Pacific Music Business Camp, Junior Band & Orchestra Camp, Senior Band, Orchestra, Choir Camp, Senior Piano Camp, and Pacific Music Theatre Camp. Tuition with housing $790-985, tuition alone $690-885. 7/8-14 and 7/15-21. 120-175 students, 50 teachers. Contact: 209-946-2416, [email protected]acific.edu. Composition Workshop. Young artists study and write composition for small forces through the lens of the 21st century through daily classes in harmony, orchestration and compositional techniques. Guest artists perform students' works in recital. Admission by interview and submission of at least one previously composed work. Tuition $2,475. 6/18-7/13. 15 students, 1 teacher. Gilbert & Sullivan Scenes. The Gilbert & Sullivan Scenes program explores the Topsy-Turvy world of rollicking pirates, damsels in distress, and modern major generals! Lamplighters Music Theatre artistic staff directs daily classes in singing, acting, and stage movement. The program culminates in a fully staged and costumed performance. Admission by audition. Tuition $885. 6/11-23. 38 students, 9 teachers. S A Stanford Jazz Workshop, Stanford, offers one- and two-week jazz immersion opportunities for middle school, high school, and college students, as well as adults. Students study with some of the greatest jazz musicians in the world, focusing on improv skills and combo performance. Programs are integrated with the Stanford Jazz Festival. Tuition $850-$2,150, depending on program and housing choices. Giant Steps Day Camp, 7/9-13; Jazz Camp Week 1, 7/15-20; Jazz Camp Week 2, 7/22-27; 2-week Jazz Comprehensive, 7/15-27; Jazz Institute, 7/29-8/3; 2-week Advanced Institute, 7/22-8/3. Contact: 650-736-0324. S A Whole Music Camp, Norden, offers traditional string classes to adults and kids in a blend of technical instruction, ear training, and jam sessions. Our family-style program offers full, private mountain access during its session and includes core string classes, general music jams, elective classes, dances and festive evening gatherings. Tuition with housing $950. 7/16-21. 100 attendees, 12 teachers. Con­tact: [email protected]. A Flutes by the Sea Masterclass, Half Moon Bay, is an intensive course with masterclasses, concerts, flute choirs, pedagogy, entrepreneurship, and business of music lectures. Tuition alone $399. 6/21-24. 10 participants, unlimited auditors. Masterclass teachers Jill Felber, Viviana Guzman, Fluterscooter, Barbara Siesel. Contact: [email protected] gmail.com. S Rocky Ridge Junior Music Program, Estes Park. S A Rocky Ridge Music Center Young Artist Seminar, Estes Park. Open to students age 18-24, this program offers private lessons chamber ensembles, orchestra, concerto competition, performance classes, masterclasses, recitals, and panel discussions. Tuition with housing $3,600. 6/19-7/15. 70 participants. Contact: 970-586-4031, [email protected] rockyridge.org. S Gatorland Band and Instrumental Music Camps, Gainesville, are designed to offer student musicians the ability to experience the beautiful University of Florida campus, live and learn in our facilities, and get to know the wind and percussion faculty while participating in exciting music learning experiences. All campers are under constant supervision by DCF-certified camp counselors who are also licensed educators. Contact: 352-273-3146, [email protected]. Instrumental Music Camp gives students the opportunity to study with UF Studio Faculty and Alumni on individual instrument-specific masterclasses, literature, solo and ensemble and All-State audition music. Tuition with housing $315, tuition alone $240. 6/23-25. UF Total Musician Band Camp provides an excellent opportunity for musicians with a minimum of one year of study on their chosen instrument to improve their individual performance skills while participating in full-band rehearsals, masterclasses, sectionals, chamber winds, music electives and optional private lessons—all under the guidance of the professional faculty, staff, and distinguished alumni of the University of Florida. Tuition with housing $595, tuition alone $385. 6/25-30. S University of Central Florida Flute Boot Camp and Summer Flute & Piccolo Institute, Orlando. UCF Flute Boot Camp is a three-day intensive program designed to educate and inspire young middle and high school flutists. Pilates and Yoga, daily masterclasses, and individual coaching appointments provide continual and concentrated input from faculty. In addition to the daily curriculum, guest artists will give classes to the students. Areas of Concentration: Fitness, Nutrition, Preparing for Marching Band (Memorization), Daily Flute Master Class. Director: Dr. Nora Lee Garcia-Velázquez. 6/8-10. tuition $150, housing (optional) $100. S University of Georgia Summer Music Institute, Athens, is for serious musicians in grades 10-12. Students participate in a chamber ensemble, attend lectures, and laboratory exercises for advanced musicians. Open to string, wind, brass, piano, percussion, voice, and guitar students. 6/3-7. 50 students, 15 teachers. Summer Music Camp is for students in grades 6-12 who have studied an instrument for at least one year. Students rehearse, take private lessons, attend musicianship classes, perform, and have daily masterclasses with UGA faculty. 6/3-7. 600 students, 60 teachers. S Chicago Chamber Music Workshop, Chicago, is an exceptional, comprehensive music camp for serious music students in grades 7-12. Students take part in chamber music study and performances, inspirational masterclasses, and electives, including private lessons with outstanding faculty. Students stay in dormitories of Lake Forest College with one roommate. 7/9-21. 48 students, 16 teachers. Contact: Jeremy Krifka at 847-926-9898, [email protected] mya.org. S Indiana University Summer Music Clinic, Bloomington. S Lutheran Summer Music, Valparaiso. A four-week residential training and performance program for band, orchestra, choir, organ, piano, and composition students in grades 8-12. During the four weeks on the Valparaiso University campus, students have the opportunity to perform in chamber ensembles and small ensembles, take private lessons, and create lifelong friendships. A two-week option is available. Tuition $3,495. 7/1-29. 30 teachers. Contact: 612-879-9555, [email protected] summermusic.org. S Orangehaus Music Business Camp, Anderson. S So, you want to teach music! Music Education Camp, An­derson. S String Camp at Anderson Uni­versity, An­derson. S University of Kansas Midwestern Music Camp, Lawrence. Berklee’s Business of Music Summer Program focuses on music business with emphasis on the recording industry, new marketing strategies, and music entrepreneurship. Topics covered include business, legal, and technological issues affecting independent record production, record companies, music publishing, talent management, concert promotion, and the changes brought by the move to digital. Tuition $715 + $415 housing + $50 application fee. 6/15-16. Berklee Groove School. Explore the possibilities in the world of rhythm. Whether you play bass, drums, or percussion, this program will enrich your repertoire with different methods for improvisation, rhythm, and performance skills. Through clinics, concerts, and personalized ensemble instruction, Berklee’s faculty and visiting artists will guide you through a variety of styles and take your musicianship to the next level. Tuition $732 + $460 housing + $50 application fee. 6/15-17. Berklee Piano/Keyboard Workshop is for players interested in developing their skills in improvisation, chord theory, comping, ensemble playing, and synthesizer technology. The workshop offers practical playing experience through ensembles with full rhythm sections, performance workshops, and improvisation labs. Concentrate on jazz/blues, pop/rock, R&B, or Latin styles. Tuition $1,265 + $875 housing + $50 application fee. 8/13-17. Berklee Global String Intensive offers participants the chance to explore in-depth a wide variety of string styles, including folk, jazz, bluegrass, classical, old-time, and Celtic. Tuition $1,265 + $875 housing + $50 application fee. 6/25-29. S Blue Lake Fine Arts Camp, Twin Lake. S Interlochen Arts Camp, Interlochen. Each summer, over 2,500 students from all over the world come to Interlochen to study music, visual arts, theatre, film, dance and creative writing. Music students perform in the 3,900-seat Kresge Auditorium, the 950-seat Corson Auditorium, Dendrinos Chapel and Recital Hall, the historic Interlochen Bowl, and the new, open air Upton-Morley Pavilion, as well as other locations around our scenic, lakefront campus. Both one-week instrumental institutes and multi-week programs offered. For grades 3-12. Session dates 6/16-8/6. Contact: 800-681-5912, [email protected] interlochen.org. S Seminar 2018, Kalamazoo. Western Michigan University's Seminar is designed to serve as an enjoyable, pre-college experience for serious musicians in grades 9 through 12, including 2017 graduates. It promotes artistic, social, recreational, and cultural interaction among the participants. Acceptance and scholarship decisions are based on a recorded audition and music teacher endorsement letter. Tuition with housing $1,685, tuition alone $1,485. 7/8-21. 120 students, 60 teachers. Contact: [email protected] wmich.edu. A Amy Porter’s Anatomy of Sound, Ann Arbor, presents an opportunity for adult flutists of all ages to participate in masterclasses and join in-depth discussions about the study of flute tone, breathing, and body awareness both in flute practice and in performance. Tuition $700 6/2-5. 15 performers. Masterclass teachers Amy Porter, Leone Buyse. Contact: [email protected] umich.edu. S ATHENA Music and Leadership Camp, St. Cloud, is an all girls band and orchestra camp that offers ​middle and high school-aged musicians a five-day, intensive, music study while emphasizing leadership and team-building skills. Our faculty consists of professional women who teach band, orchestra, and private lessons at the elementary, middle school, high school, and college levels. Tuition with housing $565. 7/22-26. Contact: 678-910-0232, [email protected] musicessentialsonline.com. S Kansas City Saxophone Work­shop, Kansas City, gives high school students the opportunity to study with renowned saxophone performers and instructors. Whether you’re looking to make All-State band, prepare for college auditions, or are just trying to improve, this workshop is for you! Tuition with housing $620, tuition alone $420. 7/10-14. 24 students, 2 teachers. Con­tact: 816-235-5448, [email protected]. S UMKC Double Reed Institute, Kansas City, provides students the opportunity to work with UMKC faculty, play chamber music, learn the craft of reed making, and perform. Double reed (oboe and bassoon) students will benefit from learning to play music in a variety of settings including masterclasses, lessons, and chamber music. Tuition with housing $470, tuition alone $270. 6/25-29. 20 students, 2 teachers. Con­tact: 816-235-5448, [email protected]. S UMKC Jazz Camp, Kansas City, brings world-renowned performers and jazz educators to Kansas City to work with talented young instrumentalists ages 12 and up. Jazz Camp co-directors Bobby Watson and Dan Thomas and distinguished clinicians provide insight and inspiration to student combos in a welcoming environment. Tuition with housing $570, tuition alone $370. 6/24-28. 100 participants, 10 teachers. Contact: 816-235-5448, [email protected]. S A UMKC Composition Work­shop, Kansas City. Composers will broaden their horizons and hone their craft in this mix of classes and small group sessions with UMKC composition faculty. This exciting week-long experience helps young composers find their creative voices while improving their musical skills and joining the community of composers and new music lovers. Tuition with housing $820, tuition alone $520. 6/17-23. 30 students, 6 teachers. Contact: 816-235-5448, [email protected]. A Advanced Choral Conducting Workshop, Kansas City. Join us in Kansas City for a workshop focusing on conducting technique for the choral conductor. Current high school and university faculty as well as graduate students in conducting are welcome to apply. Participants may enroll either as conductors or as observers. Conducting spots are limited to 12 participants. Tuition with housing $490, tuition alone $370. 5/30-6/1. 12 conductors, unlimited auditors, 2 teachers. Contact: 816-235-5448, [email protected]. A Kansas City Conducting Sym­posium, Kansas City, is an inspirational program for instrumental conductors (orchestral and wind ensemble) wanting to improve at the art and skill of conducting. 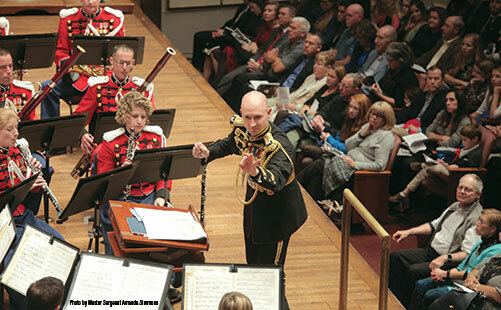 In its ten-year history, college and university faculty, conductors in the schools, as well as graduate students and upper-division undergraduates studying conducting have attended. Tuition with housing $765, tuition alone $515. 6/17-22. 25 participants, 3 teachers. Contact: 816-235-5448, [email protected]. S A [email protected], Rochester. Adventure Music Camp. One-week, full-day camp at the Eastman School of Music for commuter students entering grades 5-8. Rehearsals (strings, winds, chorus), theory in motion, composition, improvisation, and a concert at week's end. No audition required. Students must have two years' experience on their instrument and play at NYSSMA level 2 or higher. Tuition $350. 7/30-8/3. 50 students, 10 teachers. Telephone 585-274-1400. Music Horizons. This internationally acclaimed Classical Studies program is for academically inquisitive performers, conductors and composers currently in grades 9–12 who are seriously considering a career in music. Our highly individualized program emphasizes solo and chamber performance, and it offers a taste of college-conservatory life. Tuition with housing $3,679. Tuition alone $2,020. 7/8-28. 65 students, 32 teachers. Telephone 585-274-1404. Summer Jazz Studies. This rigorous two-week program provides an intensive, performance-based experience for highly motivated students in grades 9–12 and is suited for those considering jazz studies at the collegiate level. Students work directly with the renowned Eastman School of Music jazz faculty in a program designed to enhance improvisational and ensemble skills. Tuition with housing $2,377. Tuition alone $1,350. 7/1-13. 40 students, 12 teachers. Telephone 585-274-1404. [email protected] offers an individualized, world-class music education experience: residential music programs for high school students, week-long institutes devoted to various instruments or specialties for high school, collegiate, and adult students, and collegiate classes in Music Education, Music History, and Music Theory. Tuition varies. 6/25-8/3. Telephone 585-274-1074. [email protected]: Dalcroze Level 1 – The Introductory Credential. DSA Level 1 certification awarded upon completion. Tuition with housing $5,857 (3 credits), $1,842 (noncredit). Tuition alone $4,830 (3 credits), $815 (noncredit). 7/2-13. 12 attendees, 2 teachers. Phone 585-274-1074. [email protected]: Encouraging En-semble: Integrating Theater into the Music Classroom. Creative ensemble-building ideas for K-12 teachers. Tuition with housing $537-$616. Tuition alone $300. 6/28-30. 25 attendees, 1 teacher. Telephone 585-274-1074. [email protected]: Orff Schulwerk Teacher Education Course, Levels I and II. AOSA level certificates awarded upon completion. Tuition with housing $5,857 (3 credits), $1,867 (noncredit). Tuition alone $4,830 (3 credits), $840 (noncredit). 7/16-27. 20 attendees, 4 teachers. Telephone 585-274-1074. [email protected]: Schubert to Sondheim: Pedagogy for the Male Voice. Techniques for male voices (classical/Broadway). Tuition with housing $2,084 (1 credit), $1,139 (noncredit). Tuition alone $1,610 (1 credit), $665 (noncredit). 7/16-20. 25 attendees, 3 teachers. Telephone 585-274-1074. Young Composers Program is a weeklong program for composition students ages 14-19, who wish to immerse themselves in contemporary music. Students learn about new music while developing creative and professional skills. Included are private lessons, listening sessions and workshops on notating musical ideas. Student compositions will be presented at a final concert. Tuition $860. 6/10-16. 16 students, 3 teachers. Summer Sonata is a weeklong piano program for ages 12-18. Audition is required. Daily activities include lessons, classes in theory and Eurhythmics, form/composition, improvisation and literature. Guest artists are Alvin Chow, piano professor at Oberlin Conservatory, Daniel Shapiro, piano faculty at CIM, and Tianshu Wang, piano professor at Capital University. Tuition $850. 6/24-30. 20 students, 10 teachers. S The MasterWorks Festival, Cedarville, is an intensive, four-week festival for advanced and passionate students of the classical performing arts. Prospective students can choose from a variety of programs, ranging from music to theatre, as well as technical internships. Together, world-class faculty and gifted students present brilliant performances in an atmosphere of dynamic Christian faith. 6/17-7/15. 200 participants, 75 teachers. Contact: 574-267-5973, [email protected] art.org. S Carnegie Mellon Pre-College Music Program, Pittsburgh, hosted by the Carnegie Mellon University School of Music, provides a conservatory environment where prospective performers, composers, conductors, and teachers prepare for professional careers in music. Application deadline: 5/1. Session dates: 6/30-8/10. S West Chester University High School Summer Music Institute, West Chester. We offer instrumental, piano, and vocal tracks as well as an honors track (audition required). Students participate in large and small ensembles, a solo recital (by audition), music theory classes, and audition/college-prep classes. Each student receives two 30-minute private lessons. The faculty consists primarily of WCU music professors. Tuition with housing $700, tuition alone $610. 7/9-14. 75 students, 20 teachers. Contact: 610-430-4177, [email protected]. A Pocono Flute Camp, East Stroudsburg. A flute camp designed for adult amateur flute players and flute hobbyists held in the heart of the beautiful Pocono Mountains. The week includes workshops, chamber music, and flute instruction in a non-competitive atmosphere. Held at East Stroudsburg University, the on-campus housing and meals allow for an affordable opportunity for everyone. Tuition with housing $615 ($600 for seniors), tuition alone $240 ($215 for seniors). 7/22-27. 32 students, 4 teachers. Contact: [email protected]. A Summertrios, Bryn Mawr. Geared toward adult amateur musicians, held at Bryn Mawr College and Wilson College, repertoire choices are available for duos to large ensembles, including string quartets, piano trios, and wind ensembles (pianists choose their repertoire). Programs include sightreading classes and workshops. All participants are scheduled for playing time with faculty. Scheduling in compatible peer groups addresses each player’s individual needs. Performance is optional. Private lessons available. Session dates: ProAm Week 6/3-10; Ensemble Week 6/10-17; Intensive Week 6/17-24. 75 participants, 25 faculty. Contact: [email protected] trios.org. S A Pender Island Flute Retreat, Pender Island, BC, presents a unique opportunity for professional and advanced University flutists (18 and over) to reach new heights in performance and teaching through the integration of musical and personal development. The combination of an encouraging, compassionate, non-competitive environment, brilliant teaching and a beautiful ocean front setting creates the opportunity to experience the mystery and magic of music on a profound level. S Berklee’s Summer Performance Program in Spain, Valencia. Berklee College of Music’s international campus in Valencia offers a comprehensive summer music performance program for two weeks featuring world-class Berklee faculty, flamenco workshop, state-of-the-art facilities, and a chance to study a variety of contemporary music styles, including jazz, Latin jazz, fusion, pop/rock, R&B, and Mediterranean music. Students from over 30 countries and all skill levels attend to focus on performance skills and enjoy the vibrant summer life on the Mediterranean coast. For students minimum age 15 years old with six months (minimum) of instrument or voice experience. Tuition $2,480, housing not available. 7/16-27. Contact: summervalencia @berklee.edu. A Barcelona Flute Symposium, Bar­celona. Six-day flute symposium with Dr. Tia Roper. Master classes and performance experiences with local Spanish players including the famous Sagrada Familia Cathedral. Three days in charming Catalan farm house and three days in Barcelona. Visits to flute traverso maker and other musical sites of interest in Barcelona. Tuition with housing €2,480 (early bird €2,295). 9/17-22. Contact: 347-512-3918, [email protected].